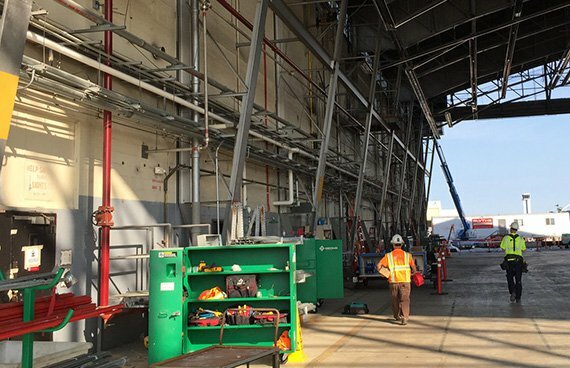 Blue Mountain Electric managed and sorted 1,000 plans on Fieldwire and tracked all upcoming electrical tasks on the $50m Puget Sound Naval Air Station hanger retrofit. When we think of airplanes, our first image is usually of an open sky with the miniature silhouette of a jet high above us. What we might not picture, and what requires a lot of attention, is the facility that houses these great metal birds when they’re not gliding through the clouds. One such base, the U.S. 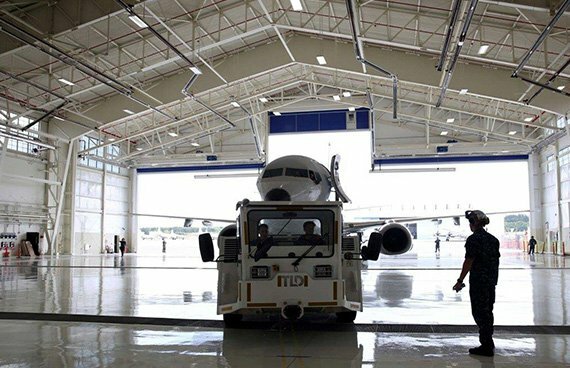 Naval Air Station on Whidbey Island in Puget Sound, recently needed two of its hangar bays to be retrofitted. As one of the designated mega-projects in development by the Department of Labor, some sturdy shoulders were needed to bear the weight of this challenge. Enter Blue Mountain Electric, a Washington-based, veteran-owned industrial and commercial electric company. 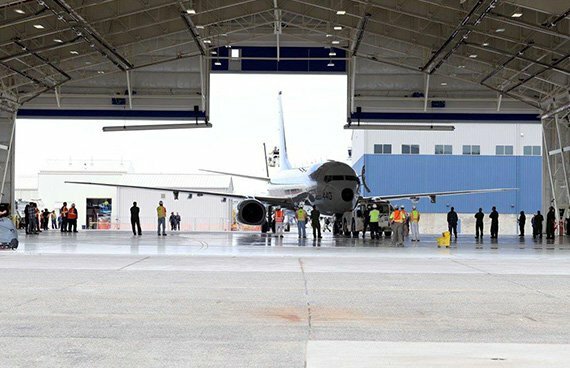 With years of experience working on Navy installations and design-build projects, there was no business better suited to shepherd the electrical aspect of the almost $50 million Hangar 6 expansion project on NAS Whidbey Island. While other contractors are handling the general construction, the new aircraft hangar for this naval base cannot reach full functionality without Blue Mountain to give it a pulse. After construction on the hangar began, Nathan Howat, the Vice President of Blue Mountain Electric, sought a solution that would keep up-to-date drawings in his crew’s hands. Previous tools that Howat had tested to resolve this issue did not adequately suit Blue Mountain’s needs and fueled his search for a better alternative. That search ended when he discovered Fieldwire, a construction management app that allowed the Blue Mountain team to retain all of their detailed on-site markups even after updating the sheet versions. The ability to deliver current drawings to his employees without losing valuable data certainly struck a chord with Howat. The next hurdle that Howat’s team encountered on the Whidbey Island project was speed, specifically the increasing amount of sheet changes. In the past, the project had been peppered with printed drawings that needed to be replaced at a near-impossible rate. As a result, the prospect of a modern method for plan versioning that could match the quickening pace of design updates without sacrificing information helped Fieldwire stand out to Howat. His team now had the tool they needed to address new additions to the naval base hangars at the speed they came in, and receiving current drawing information helped substantially reduce rework and accidental efforts. “We are using Fieldwire for a lot of drawing management,” says Howat. “When we first received the original set of drawings, within 2 months they sent out a clarification that changed about 150 electrical drawings. So as soon as we received those, all of the drawings I had previously printed were no longer valid. I had to then reprint them and get them out to my crew. The expansion of Hangar 6 involves more than a few basic additions and maintenance. Given the nature of the facility as a naval air base, the daily activity of its occupants cannot simply cease while construction is underway. This presents a unique set of challenges for Blue Mountain Electric, as do the complex structural obligations that the hangar bay must meet in order to be up to code. But thanks to the intuitive management features available in Fieldwire, these day-to-day obstacles are greatly diminished. Once their worries about drawing control had been alleviated, Howat and his team still needed a simple way of locating their plans in the app without any fuss. Luckily, the plan tagging system in Fieldwire provides an easy solution for grouping and filtering all project plans on the fly. With so many drawings to sift through, using plan tags dramatically simplifies the whole procedure. Another built-in resource that Howat makes use of is the “@” sign feature, a savvy shortcut to quickly assign attributes and ownership to tasks. By leaving a comment using the “@” sign method, he can assign a task to one of his employees then and there, and the real-time notifications generated by Fieldwire’s task management system alert him whenever that task is then updated by the owner. This makes tracking his team’s progress and staying on top of important deadlines a lot smoother. The same is true for the project’s general contractor, who started using Fieldwire after an introduction from Howat. The app allows them to successfully coordinate their efforts and strengthen communication between multiple trades. The capabilities of Fieldwire are not the only aspects of the app keeping Howat on board. The ease of use and the ability to pick up your mobile device and access all project data while on the job site have also made a huge impact. It took no time at all for the Blue Mountain team to learn the ropes and incorporate Fieldwire into everyday activities, and through continued use, their on-site efficiency began to grow considerably. Despite a rocky start, the hangar expansion project began to turn around. Since utilizing Fieldwire to handle drawing management and task tracking, there is now less confusion among the on-site crews and accidental construction based on outdated plans has also disappeared. By rallying behind this new approach to organizing their project, Howat’s team is saving more time and reducing the unnecessary ins-and-outs of conveying daily updates to each other. There are also notable monetary savings to be seen as well. Despite significant challenges inherent in design-build remodel projects, the modifications to Hangar 6 on NAS Whidbey Island have continued without a hitch thanks to the dedication of Nathan Howat and the Blue Mountain Electric team. Through their collective skill and the practical magic of Fieldwire, they have continued to march forward and improve the naval air station with top-of-the-line work. Accurate drawing control, lightning-fast access, and innate usability helped ignite what, up until then, the project had been missing. The success derived from adopting Fieldwire will surely carry over into future projects for Blue Mountain, as well as anyone wise enough to lend Howat an ear. “I have already recommended Fieldwire to other companies, and I’m getting good feedback from them. They like it as much as I do,” says Howat.